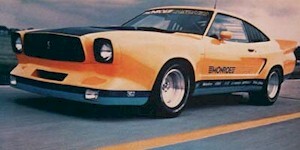 1978 The 1978 Monroe Handler Mustang was a body kit created to promote the Monroe Handler series street performance shock absorbers. Creative Car Products sold the 8-piece fiberglass body kit. Pieces included the front air dam, rear spoiler, rear body panel, all 4 fenders. The kit was called the "Handler II". It was designed by Dave Kent. One (original) car was built with a metal body kit. Six more were built using fiberglass components to be given away as contest prizes.